The Kid has been begging for pasta lately so I decided to have some fun with it and try out some different sauces instead of sticking to the traditional (and so expected) sauces. Babaganoush is a Mediterranean dip that is eggplant based and has a great flavor from the spices in it like cumin and coriander. Since I’ve experimented with falafel flavors in a flatbread version, it wasn’t too much of a stretch for me to imagine a pasta variation with similar flavors. 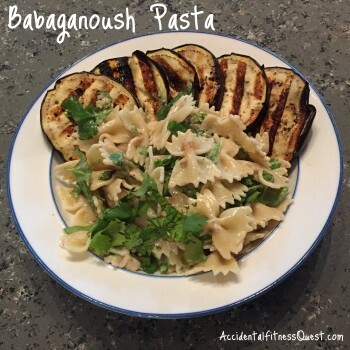 Since I had an eggplant sitting in the fridge begging to be used, the magic of babaganoush pasta came to be. I saved a few slices of the eggplant and made extra sauce for a babaganoush panini. I love playing around with different variations of the same ingredients. That way you aren’t eating the same meal multiple times. It’s always something different. Cook pasta according to package directions and drain. Reserve about 1/4 cup of the pasta water. Preheat your grill or the broiler on your oven, and line a cookie sheet with foil. Slice the eggplant into slices about 1/4 inch thick. Grill or broil the slices until they soften and begin to char on the edges. Remove from grill or oven. Mix the tahini, garlic, lemon juice, spices and salt in a small bowl. Toss the pasta with the tahini sauce, mint, and cilantro until well coated. If needed, add a bit of the reserved pasta water to thin the sauce. Divide the eggplant slices on to plates, and top with the pasta. Garnish with additional cilantro if desired. Makes 4 servings at approximately 347 calories – 11g protein, 51g carbs, and 9g fat. If you’re looking for more ways to use your eggplant, check out the roasted eggplant with pomegranate and cumin tahini cream. OMG, was that good!